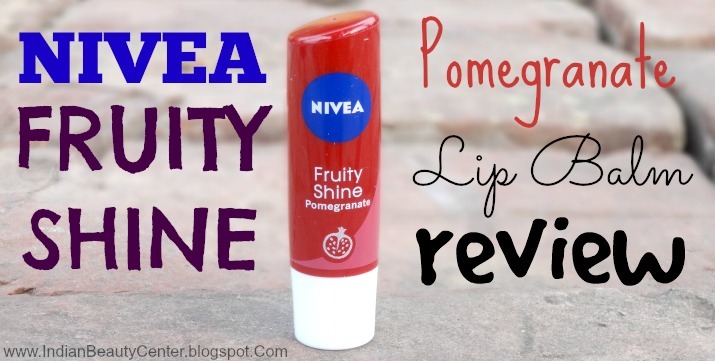 Claims : Nivea Fruity Shine Pomegranate, delights your lips with a delicious fruity fresh Pomegranate aroma and fabulous shine and color. Get soft and smooth lips with its gentle care and extra moisturisation. Do you want endless moisture for your lips and sheer yet brilliant colour that works day and night? Fruity Shine Pomegranate is the new, exotic way to love your lips: with coloured pigments that give long-lasting moisture and Pomegranate aroma for soft, smooth and endlessly kissable lips. How It Works : An innovative formula with Hydra IQ gives long-lasting moisturisation. The combination of Pomegranate flavour and chosen pigments provides an exciting fruity flavour, leaving a touch of delicate colour on soft and smooth lips. It comes in the usual Nivea Fruity Shine Lip Balm stick. I just have one more variant to review after this (Watermelon) and I would have covered up all of the Nivea Fruity Shine Lip Balms. After using this for this long a time, I have realised that these lip balm are really good ones. The packaging is travel friendly and the retractable stick looks gorgeous too. In comparison to Maybelline Baby Lips, these are a little less worth the rave. But, every product is unique in its own way! This one is one of my favourites from the Nivea lip balm range. It smells amazing, really really amazing. Also the color of this one is a bit more intense. Of-course, it won't cover up like a lipstick but the hint of color it adds to the whole look is superb and gives you juicy lips. I have to reapply this after every 2-3 hours or when my lips feel dry. I always carry lip balms in my bag only because I want my lips to remain soft and healthy. When my lips are not properly hydrated, they look dull and chapped. This lip balm does help me with the chapped lips problem. It heals the lips over a period of time and my lips look kissable. This is not a medicated lip balm but works fine for me. this is budget friendly considering the quantity you get. This particular variant, pomegranate, is much better as compared to the other ones in terms of the moisturization and quality and of-course, fragrance. Some might find the fragrance a bit too fruity or artificial. It contains a lot of shimmer particles. Don't worry, the shimmer will not bother you too much as they are like micro-shimmer particles. But yes, the shimmer might get transferred to the area around your lips but that is ignorable because that is not much visible. Excluding the flaws this lip balm has, it is a really good one. It works fine for me and I am sure it would work nicely for you too. I love this pomegranate one! Happie Easter :D I love the tint this Nivea Fruity Shine Pomegranate Lip Balm has to it too!